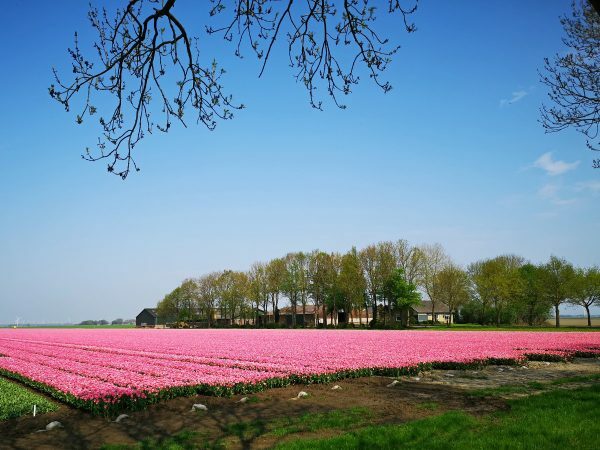 There are four main areas where you can see tulips in the Netherlands. 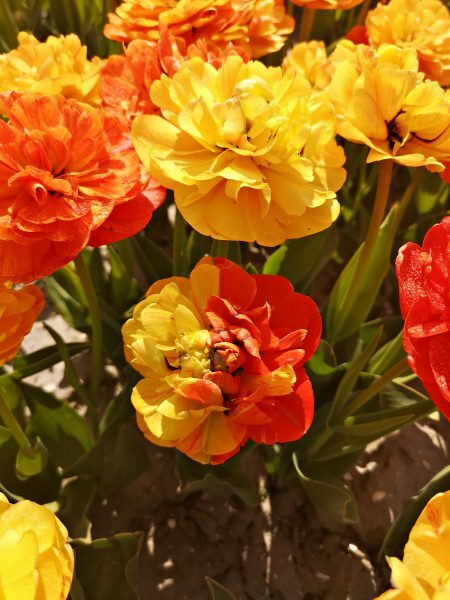 Of course, there will be tulips all over the country during Spring, but these four areas are probably where you will find the most tulips! One place you will see them is, of course, in Amsterdam. 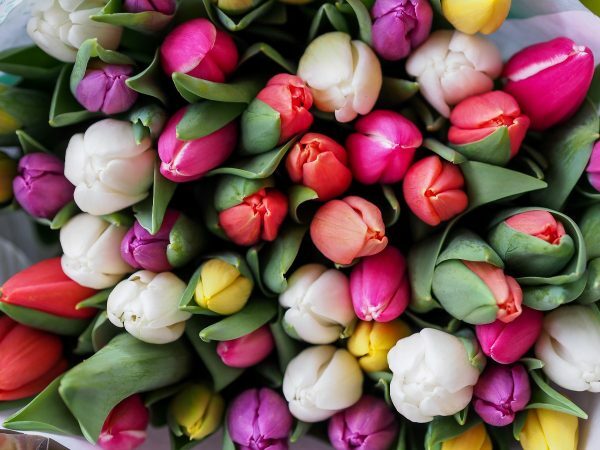 During tulip season there are numerous displays of tulips and other flowers throughout the city and a visit to the famous floating flower market is also a guaranteed way to see beautiful fresh tulips. Here you can also buy bulbs to take home with you. Not far from Amsterdam is one of the most famous tulip gardens in the world: Keukenhof! 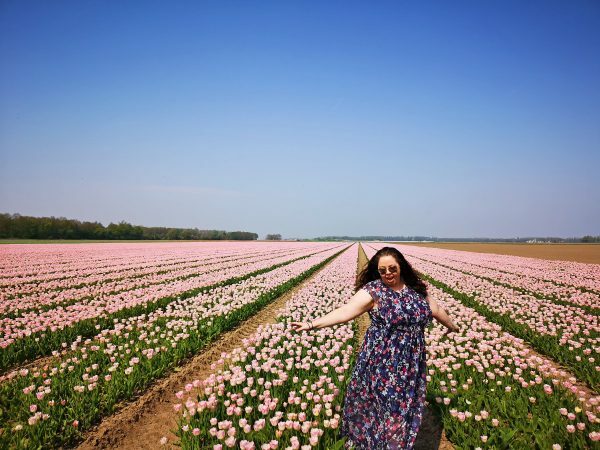 It’s one of the world’s largest flower gardens and every year the 79 acres are planted with around 7 MILLION flower bulbs. Here you will see tulips of course, but also hyacinths, crocuses and other beautiful flowers, all planted in fascinating and beautiful designs. Keukenhof is only open from the middle of March to the middle of May, but receives more than a million visitors each year during this short time! I would definitely recommend visiting Keukenhof at least once in your life, but the high price tag and crowds of people might put you off a bit. In that case there are also two other main places you can see tulips for free (or nearly)! 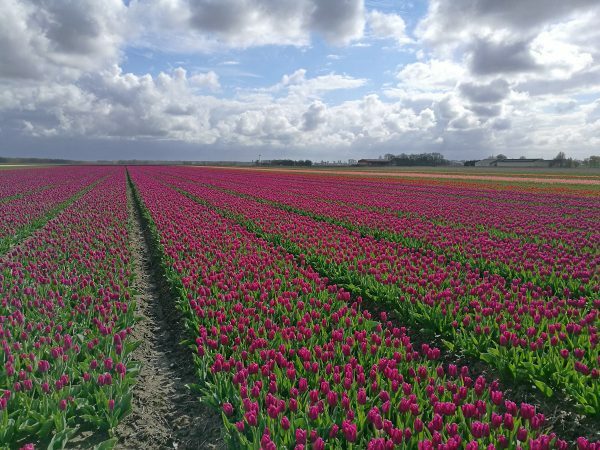 One of these is nearby to Keukenhof, in the tulip fields of Lisse and around The Hague. You can see them from the train if you are travelling between Amsterdam and The Hague but you can also hop off and hire a bike to ride around and see them close-up. This is getting more popular among those in the know, particularly since there are sometimes pretty traditional windmills and even a steam train in the area to add to your photos. But there is another great place to see tulips for free in the Netherlands, and hardly anyone goes there. That place is my home, the province of Flevoland! 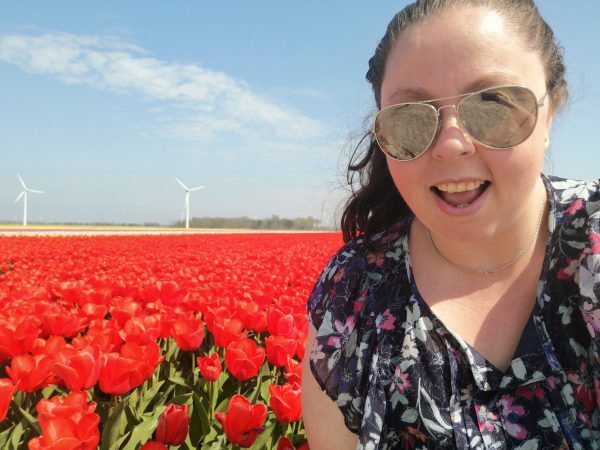 Most guides I have read seem to think that all the tulips in the Netherlands are only to be found in the South-Holland area around The Hague and Lisse. 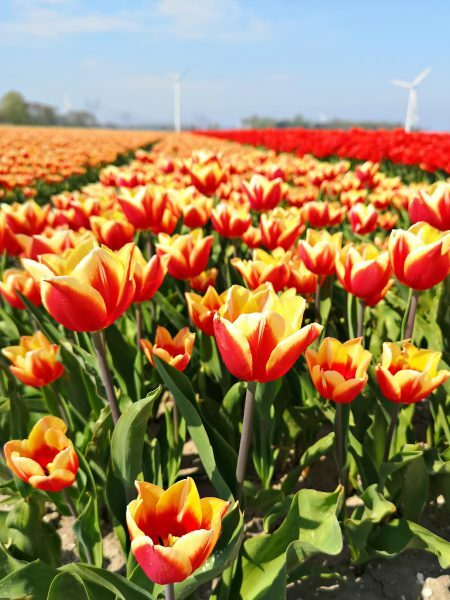 But Flevoland is actually the province that produces the most tulips, with over 5,000 hectares of tulip fields in the youngest Dutch province! Flevoland is entirely made up of reclaimed land – what used to be the sea – and has only been around since the 1950s and 60s. 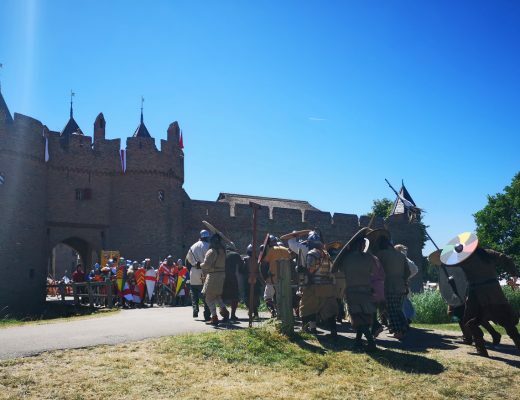 Not many tourists know about or bother coming here when exploring the Netherlands, but it’s actually a very interesting area with lots of fun things to see and do! For example, you might like to read my guide on 10+ fun and free things to do in Lelystad (where I live) and perhaps combine the activities with tulip hunting too. 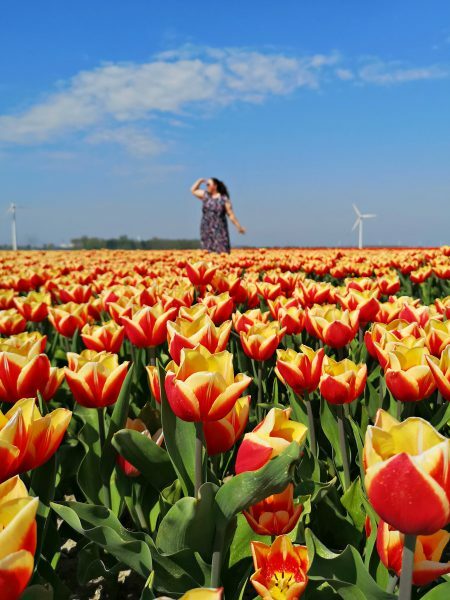 I do suggest using Lelystad as a base if you want to explore these less-visited tulip fields as it is easy to get to by train from Amsterdam if you are using public transport. 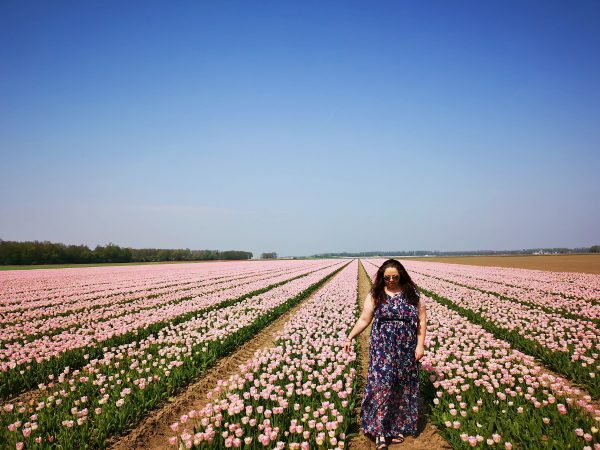 The Noordoostpolder is also a great place to see tulip fields (and more) but you will need a car or to navigate the bus system as the Dutch train system skips the area entirely. 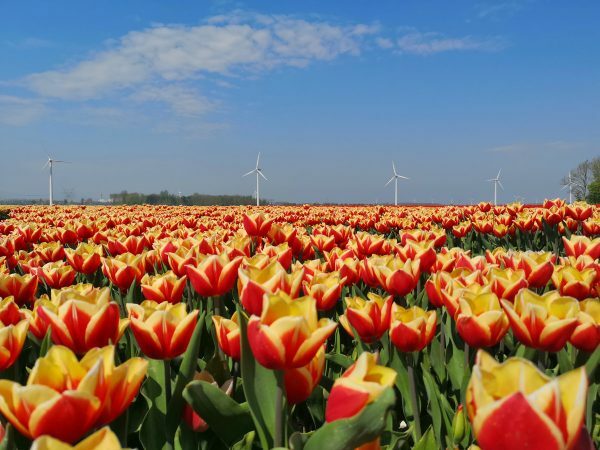 If you are especially interested in beautiful flowers and plants and do have a car then you should definitely visit the Noordoostpolder to see the tulips and also to visit De Orchideeën Hoeve. This amazing indoor tropical garden is really different and fun, and definitely worth the journey if you are in the area. You can read more about it in my post here. 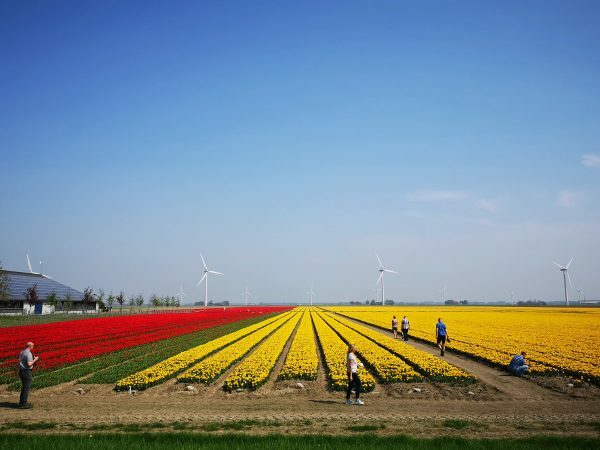 But let’s get into the nitty-gritty of finding the tulips in Flevoland! 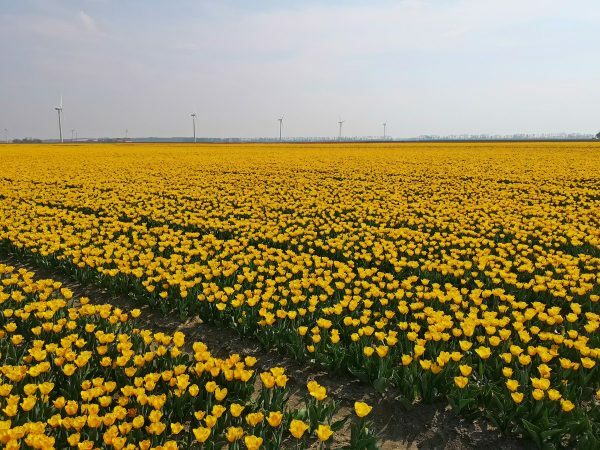 While the tulip fields of Flevoland may be less well-known than the areas of Lisse and Keukenhof, they’re not completely off the radar of Dutch locals. 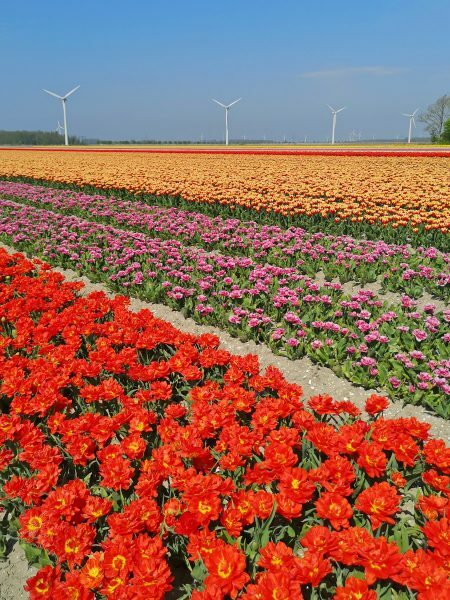 There are activities and events that take place during tulip season and handy guides on walking, cycling and driving routes to see the best of the fields in bloom. If you don’t have a car then I would suggest bringing your bike – you can take bikes on Dutch trains outside of peak hours or anytime if you have those nifty fold-up ones! You can easily rent bicycles in Amsterdam if you are travelling from there for the day, or at the local Halford’s store in Lelystad which is located just around the corner from the train station. 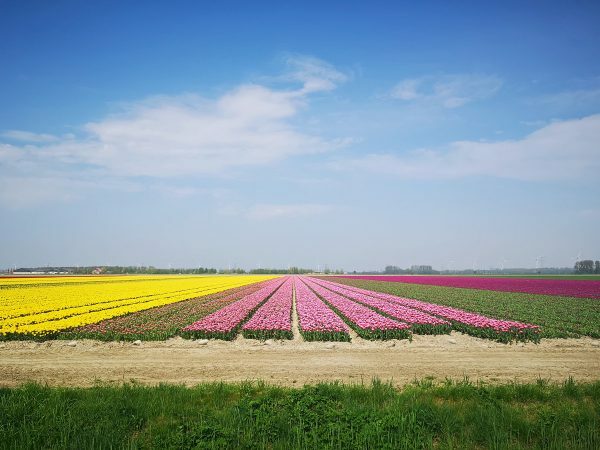 But the easiest way to see tulips in the Netherlands is by car. With a car, you will be able to see more in the same amount of time, but obviously, not everyone will have one. We usually travel by car since we have one and it means it’s a lot easier to get to some places with limited public transport. 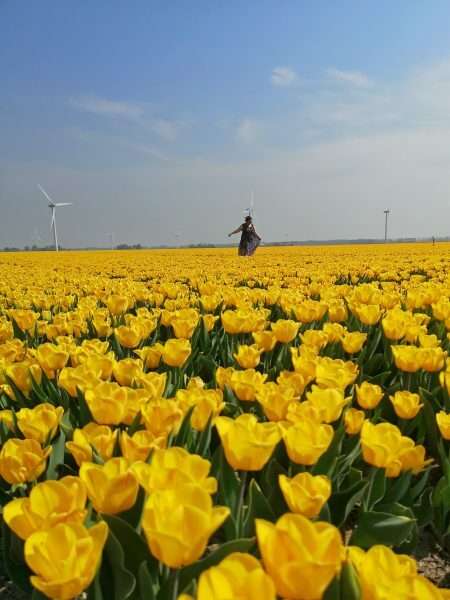 If you are planning to hire a car to visit places outside the big cities (like Giethoorn perhaps) then you could easily also visit the tulip fields during spring this way too. Dennis and I met up with my blogger friend Christina (from Happy to Wander) one sunny day about two weeks ago and went hunting for tulips! 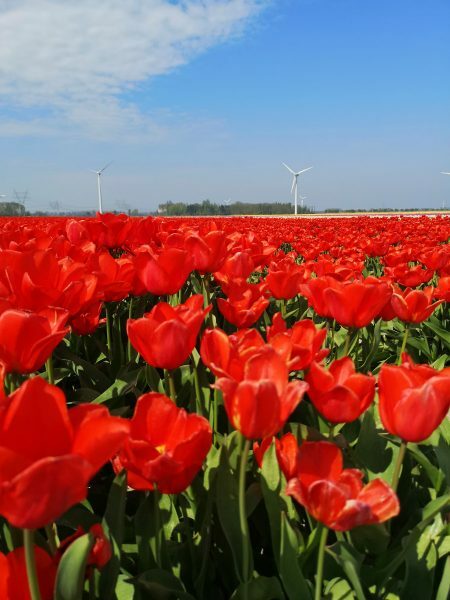 We used the downloadable tulip routes from the Tulpenroute Flevoland website which is available in five different languages. 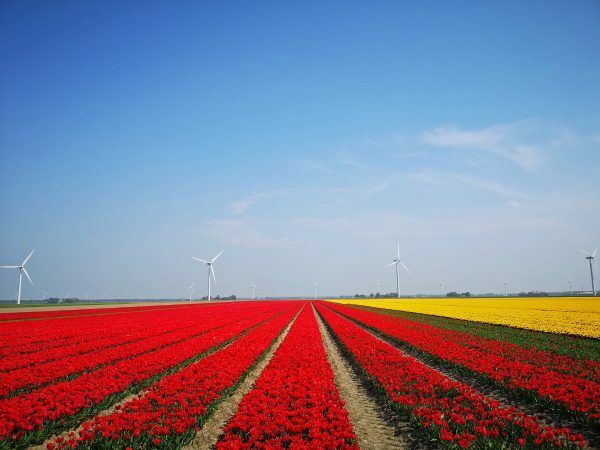 I was actually really surprised how many tulip fields were located right in/by Lelystad since last year we had only looked for them in the Noordoostpolder! But we didn’t have to drive very far to find lots of stunning fields filled with bright tulips. Some of the fields we found were gated, with signs asking people not to walk into them, some were open and we even found one place where a lovely farmer had made his fields accessible to visitors! 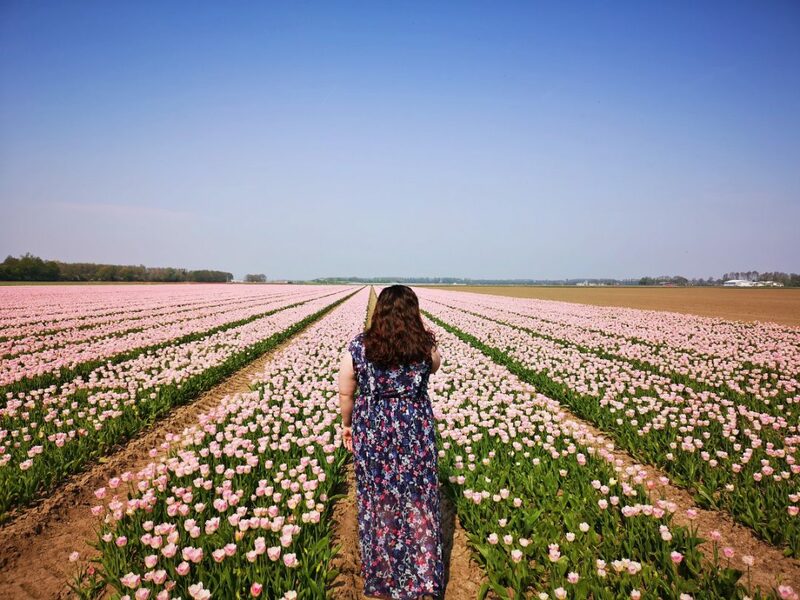 There were signs inviting you to walk among the fields and he/she/they had also left one row free in each field so that you could walk through the tulips without damaging them. This was the busiest field we saw all day, with only those six other people there as we were leaving. If you walked further into the field you would be almost by yourself. Most of the time we saw one or two other people and usually, we had the fields all to ourselves! Even in fields not set up this nicely for visitors you can walk between the rows of flowers (if allowed into the field) so long as you are careful. We were very careful not to touch, pick or knock the flowers as we posed for photos as these fields are someone’s livelihood. 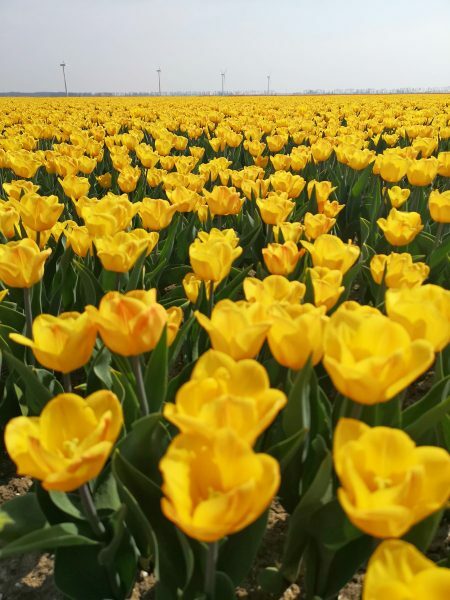 Although, after further research, I’ve found out that these fields are usually grown to flower then the flowers are cut off as they are only growing them to sell the bulbs for export! But still, with the way everything is set up so that visitors can also get beautiful photographs, you wouldn’t want to pick them too early or damage them. 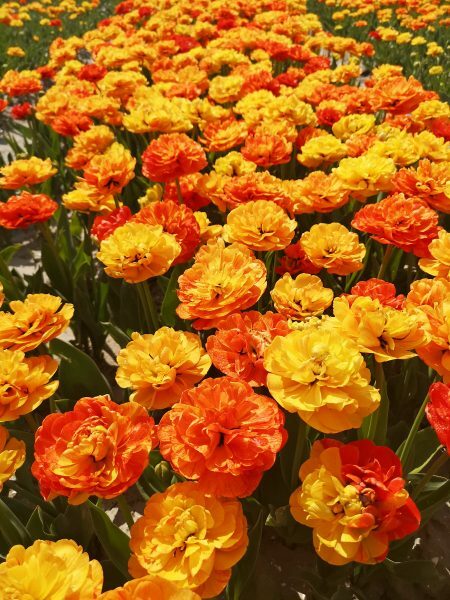 We didn’t think these ones (below) were actually tulips but apparently, they are the parrot tulip? Feel free to correct me if I’m wrong! Dennis and I had just got our new Huawei P20 Pro phones so we were having lots of fun testing out the camera’s capabilities! And, of course, I was having lots of fun perfecting my poses for Instagram and making poor Dennis be my Instagram boyfriend. I think he did a pretty good job though, don’t you?! 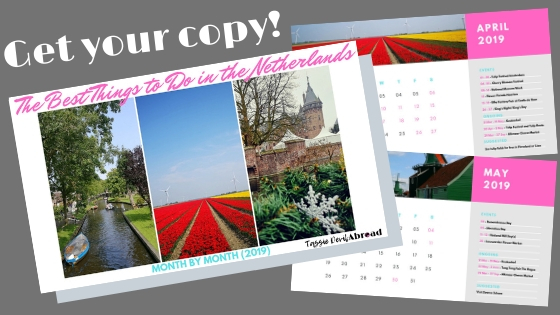 Want a free calendar of Dutch events throughout the year? 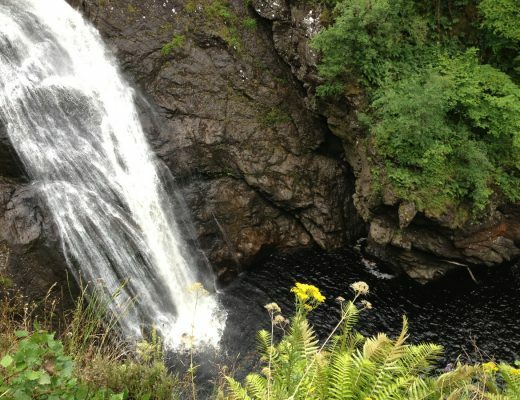 I hope you enjoyed these photos! 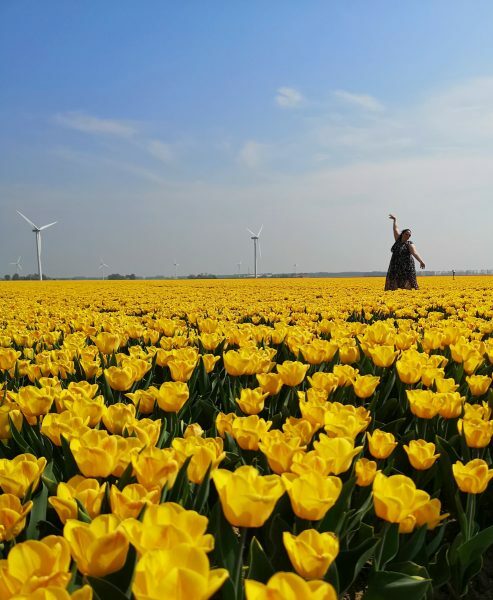 Have you ever seen tulips in the Netherlands? Let me know in the comments or pin one of these to plan your own off-the-beaten-path adventure! Do you know where exactly was the field where the farmer let you walk in the field? Ooh, good question. I didn’t take note at the time but after consulting Google maps I THINK it might be Zonnespelt on Zeebiesweg! It shows up as Zeebiesweg 50 and although there aren’t flowers in the street view pic it looks like it could be the same field to me. If you use the Lelystad driving route map from the Tulpenroute website you should be able to find it and I’ll make sure to take note of where it is if we go there again this year. Great article with useful information. I read that sometime in May the flowers are cut off the bulbs. I was planning a visit for May 8-10 this year. Is this too late to see the tulip fields (with the flowers still intact)? Hmm, I guess in some places maybe, but that’s still early in May and the tulip season is generally accepted to be March until May. If all else fails you can always go to Keukenhof and you’ll definitely see lots of lovely blooms there! Hi, nice write-up. Can you summarize places logically (car route) which one to go first from Brussels (precise place were car be parked or can take a walk from a spot). 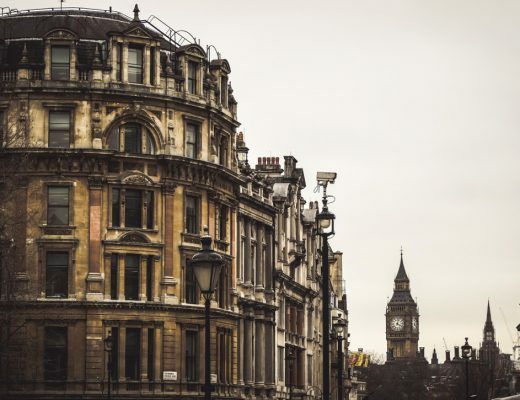 Do you have a precise location map? or address I can put in on my GPS. I am in to youtube so would like to do video. I can feature you if you are present in the field 🙂 Please write to me. If you go to the tulpenroute Flevoland website (which I linked in the article) you can download their maps for driving around the fields and then put the road name into your GPS from that. I didn’t bother making a map since I just used the one from the website for around Lelystad. Hi, Thanks I got a handle of those maps and routes. Did you use drone? if so, in which place. I like to do that as well.